George Bernard Shaw, playwright and Nobel Prize winner, said, "Except during the nine months before he draws his first breath, no man manages his affairs as well as a tree does." How should South manage his affairs in this three-no-trump contract after West leads his fourth-highest heart? 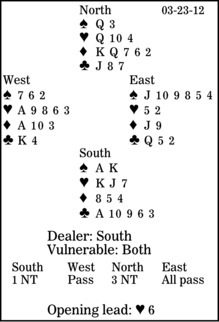 Declarer starts with only four top tricks: two spades, one heart (given the lead) and one club. He must work on both minors. It looks tempting to win the first trick on the board and take a club finesse. Here, though, West wins the trick and establishes his heart suit. And when he gets in with the diamond ace, he cashes out for down one. Even if South gets four club tricks, he needs a diamond winner, too. He should take trick one in his hand and lead a low diamond. If West wins with his ace and plays another heart, declarer has nine tricks: two spades, two hearts, four diamonds and one club. If West ducks his diamond ace, South must resist the temptation to return to his hand with a spade. If he does that, East should signal with his jack. Then West wins the second diamond and returns a spade, establishing East's suit. Declarer has only eight tricks. After getting one diamond in the bank, South should take a club finesse. If West perseveres with hearts, declarer gets into the dummy again and repeats the club finesse. Or, if West shifts to a spade, South plays a second diamond to establish that suit. By the way, while researching the quotation, I was surprised to learn that Shaw was also a co-founder of the London School of Economics.